A champion gymnast filed a lawsuit Tuesday against legendary coaches Bela and Martha Karolyi, saying they should have known she was being sexually abused by serial predator Dr. Larry Nassar during training camps at their Texas ranch. Sabrina Vega's petition is the third suit against the coaches who oversaw the U.S. national and Olympic teams for nearly two decades. It also names USA Gymnastics, the U.S. Olympic Committee and Nassar, who is serving up to 175 years in prison. "The Karolyi Defendants did nothing to protect gymnasts, including Vega, who were training at their site for weeks at a time," the suit alleges. 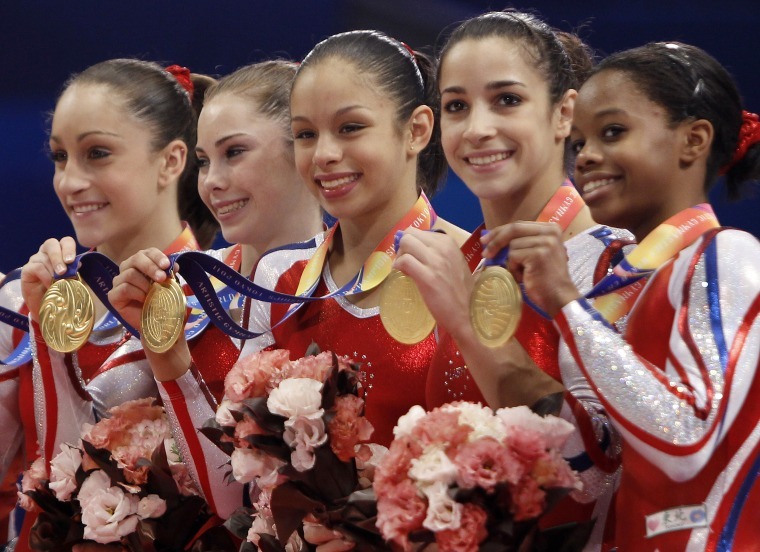 In an exclusive interview with NBC News' "Dateline" last month, the Karolyis insisted they knew nothing about Nassar's abuse of some of the biggest stars in the sport, including McKayla Maroney, Aly Raisman, Gabby Douglas and Simone Biles. They said USA Gymnastics was responsible for supervising Nassar, the team doctor, while he was at the ranch. The Karolyis themselves quietly filed suit last month against USA Gymnastics and the USOC, saying their name has been ruined by the scandal and demanding they be indemnified against Nassar-related legal actions. "USAG used the close relationship between itself and the Karolyis to its benefit and then disregarded the Karolyis when they no longer felt it expedient to keep them close," the Karolyis' suit charges. The two Texas cases are just the latest in a morass of litigation spawned by Nassar's abuse in his capacity as a doctor for Michigan State University, USA Gymnastics and a popular Michigan gymnastics gym. Vega, 22, who was a member of the national gymnastics team from 2009 to 2013 and part of the world champion 2012 team, said she is seeking more than $1 million in damages. The accusations in her complaint are familiar from more than 200 suits filed against MSU and USAG, with claims that Nassar wasn't properly supervised and that the institutions ignored warning signs he was an abuser. But Vega's action is one of a few that take aim squarely at the Karolyis, who leased part of their ranch to USA Gymnastics and served as national training coordinators. "The Karolyi Defendants were responsible for the Ranch and allowed Nassar to be alone in cabins with Vega and other gymnasts which allowed him to sexually abuse them," the suit says. "Upon information and belief, the Karolyi Defendants turned a blind-eye to Nassar’s sexual abuse of Vega and other children." Vega's attorney, Bennie Rush, said the suit was filed in Texas — and not in Michigan or California like most of the others — because that's where his client was abused. "These folks ought to be brought to justice in our own backyard," said Rush. In their NBC interview, the Karolyis denied accusations that they created a stressful, authoritarian atmosphere at the ranch that allowed Nassar to befriend the young athletes and molest them without fear of being reported. "I don't feel responsible," Martha Karolyi said. "But I feel extremely hurt that this thing happened and it happened everywhere, but it happened here, also." In their suit, they accused the USOC and the USAG of trying to "sacrifice" them and "shift blame off themselves." USA Gymnastics said it could not comment on pending litigation but in the past has said it reported suspected abuse by Nassar to the FBI weeks after first learning of an allegation. The organization cut ties with the Karolyi ranch in January in the midst of Nassar's sentencing hearing. The Karolyis' attorney declined to comment.